Meet Alan Gibson( on the left), our man on the ground in Kobe Japan. Alan coordinates weekly pickups of fresh fruit at the Port of Hyogo for the Kozmoz Kansai Food Bank. 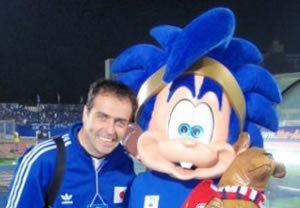 Raising kids and working can really take up your day, but Alan takes busy to a new level, heading up the new Japanese soccer magazine JSoccer, is a staff writer for the Gamba Osaka professional soccer team, and can be found DJ'ing evenings around the Kobe area. In spite of having such a demanding personal and business schedule, he was moved to make time for the needs of the less fortunate in his community upon finding out about the needs and the opportunity for him to make a difference. and the last couple of years has seen a dramatic downturn in the economy. Though our local and federal governments work in many ways to improve emplyoment and living conditions, many people can find themselves in untenable situations. Some of these people need ongoing help to allevieate their problems and some just need a hand because of temporary unemployment or unusual circumstances. The Food Bank is a tremendous resource for our communities offering assistance in many cases where it would be difficult to get more formal assistance and this can be a valuable saftey net for the children that find themselves caught up in unfortunate situations. Many of the recipients of food donations are caught between jobs and many are working families just barely making ends meet. The Food Bank can make a dramatic difference in the lives of the children of these families. However, the Food Bank can only provide these services if we have the manpower to pickup, sort, count, pack, cook, prepare, deliver, and hand out donations. As well, if we dont have manpower to answer phones and emails as well as all the little clerical things that goes along with providing these services then everything stops in it's tracks. So if you can make some time once a week or even once a month here in Kansai or in Spokane WA, please let us know. Your community will be just a little better place because of it!